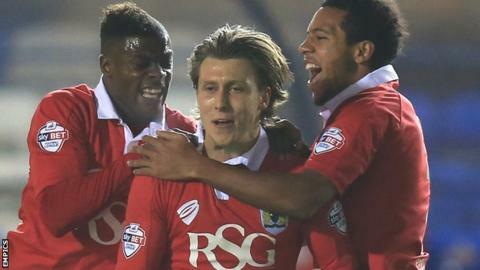 Bristol City moved four points clear at the top of League one with an easy victory at Peterborough United. Luke Freeman's finish on the turn after good work by Mark Little, and Aaron Wilbraham's header from Joe Bryan's cross, put the Robins 2-0 up. Marlon Pack's 25-yard volley hit the crossbar, before Freeman added his second after the break when he cut inside after Pack's quick free-kick. Aaron Mclean went close for the hosts but his shot deflected wide. It meant a losing second debut for Craig Mackail-Smith, who returned to Peterborough on loan from Brighton on Thursday. Match ends, Peterborough United 0, Bristol City 3. Second Half ends, Peterborough United 0, Bristol City 3. Gabriel Zakuani (Peterborough United) is shown the yellow card. Substitution, Bristol City. Todd Kane replaces Mark Little. Attempt missed. Aaron Wilbraham (Bristol City) right footed shot from very close range is just a bit too high. Foul by Craig Mackail-Smith (Peterborough United). Corner, Peterborough United. Conceded by Aden Flint. Attempt blocked. Aaron McLean (Peterborough United) right footed shot from the centre of the box is blocked. Substitution, Bristol City. Matt Smith replaces Kieran Agard. Corner, Peterborough United. Conceded by Mark Little. Substitution, Peterborough United. Erhun Oztumer replaces Marcus Maddison. Goal! Peterborough United 0, Bristol City 3. Luke Freeman (Bristol City) left footed shot from outside the box to the bottom right corner. Assisted by Marlon Pack. Substitution, Peterborough United. Michael Bostwick replaces Jermaine Anderson. Substitution, Peterborough United. Harry Beautyman replaces Jack Payne. Attempt missed. Aaron Wilbraham (Bristol City) left footed shot from outside the box is too high. Aaron McLean (Peterborough United) wins a free kick in the attacking half. Attempt missed. Christian Burgess (Peterborough United) header from the centre of the box misses to the right following a corner. Corner, Peterborough United. Conceded by Marlon Pack.